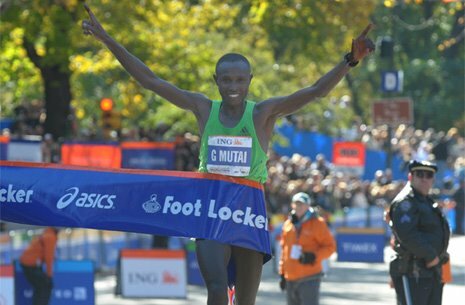 ABOUT GEOFFREY MUTAI..A RECAP AND MY CONSIDERATION..
Geoffrey Mutai won also in NewYrok and he has confirmed his fantastic race in Boston.He run in an amazing 2h05,something like incredible on NY course...but he have done it!! I don't remember the right pace but he was able to run first half in around 63' and second half in around 61':second half with Central Park to do!!!!! It is a kind of dream when he decided to push last sunday:fantastic see his head down and his legs starting opening more and more:this year i have seen similar only Moses Mosop in Chicago how he came back on Korir. I am very surprised how Mutai is able to run alone without pacemakers:2h03 in Boston and 2h05 in NewYork...so,i ask myself:What he can do in a race such Berlin this year? ?...Makau WR is completely beatable for him in a flat marathon with pacemakers! !God bless Mutai! But...who is Geoffrey Mutai?HERE you can fin his IAAF-page:he seems a native-roadrunner.His marathon-career started with an under 2h08'..we can say nothing:this is the champion of future!! If someone will speak me about Makau,i can answer:"I want to see both guys in marathon without pacemakers..after this race we gonna speak". Joe Battaglia of UniversalSports wrote THIS very interesting article day after NY about Olympics and some considerations:in my opinion Kenyan-team should be G.Mutai,E.Mutai,A.Kirui... Makau and Kipsang to see again without pacemakers before all! !...The first 3 guys demostrated to be able to run races one-against-one and in London this will be the race!! Again Joe Battaglia wrote THIS other article about Mutai...Yes,he is the best now! !The dream-show could be him against former Wanjiru:two kind of races very similar...only a dream!! On Washington Post appears in these days another interesting article that i want to suggest you:HERE you can read it...where this new generation of marathoners can go is impossible to know in my opinion and myabe too early to speak times! !Kenyans now are incredible:at this moment they can speak about Olympics with all guys under 2h04'....2 years ago totally unpredictable!! If you are interested in studies about marathon..scientific studie... HERE an article written very serious and intelligent...like it!! I promise to come back on this argument:very curious to understand what happens,what's new in kenyan-world..